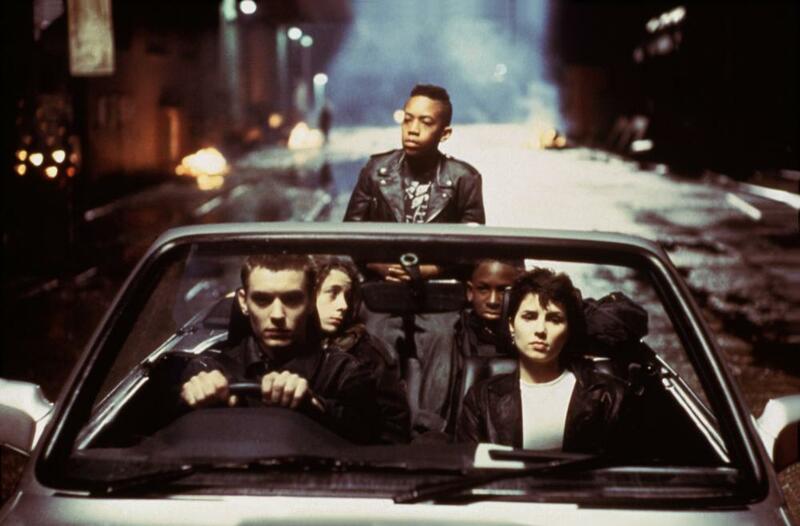 Paul W.S Anderson’s debut features a young Jude Law and Sadie Frost as ram-raiders in an urban wasteland – driving stolen cars through shop fronts and taking clothes from the fallen mannequins in a whole different kind of window shopping. A bit of the ol’ crash-and-carry. Billy (Law) is a joy-riding adrenaline junkie fresh out of a prison. An adolescent rebel eager to impress Belfast punk Jo (Frost) and make a name for himself. Coming home to find his possessions boxed up and hearing that a rival gang is growing into a criminal empire, Billy is losing sight of his place in the world and his recklessness is starting to draw unwanted attention. Shopping takes place in a dystopian near future, shot on location in London but carpet bombed with smoke making it look more like Tim Burton’s Gotham. Caught somewhere between Mad Max and Cronenberg’s Crash, the film falls short of compelling or unsettling. The acting is ropey throughout but Law brings a fresh-faced naiveté to Billy that works for his character, with occasional glimmers of his cocksure charm, and Sean Pertwee is impressive as rival gang leader Tommy. Produced on an extremely low budget, the chase scenes are impressive if not sparse. Unfortunately the film has not aged particularly well and is mired in the technology and fashion of its day. This is the 90s and so our rebellious anti-heroes sport black leather jackets and listen to electronica on cassettes. At one point Jo routes through Billy’s tapes and mocks him when she finds Spandau Ballet – this is a nod to Frost’s life off-screen, she actually left Gary Kemp for Jude Law after meeting him on the set of this film, and so the chemistry between their characters may be very real. Featuring a few of the Primrose Hill set, the North Londoners who rose to fame in the 90s, it is interesting to see these actors together for the first time, before classics Love, Honour and Obey and Final Cut. Shopping is far more stark in comparison to these later more comedic films, and was actually banned from some cinemas for its glorification of crime – though it is definitely tame by todays standards. Now it is fully restored and being rereleased on DVD and Blu-Ray. Whilst Paul W.S Anderson continues to make films based on videogames or in science fiction, this film is seen as his most serious and most impressive, though you can definitely see the through-line between this and his next film: Mortal Kombat. So the little one has come a long way. I’m just trying to catch up now. He finally has some teeth that he can use in conjunction with each other. He makes sounds that closely resemble ‘mum’ and ‘dad’ though they often veer off and are aimed at things that are certainly not us. He can wave, on occasion, mimic certain noises, crawl at high speeds, ‘cruises’ along furniture and feels the need to constantly be standing up, almost unaided. He has full agency, which means that each day I return home the lounge has transformed a little: wires are tucked away, doors are baby-proofed, everything is higher up. He mounts, climbs, and hangs off of everything he can and so now we have to be that bit more vigilant. But you can’t be there all the time.. evidently. Today, Jackson was sitting in his high-chair outside, on the uneven ground of the garden, when he leaned a tad too far and the whole thing tipped over. He fell, hitting his head on the ground and burst into open mouth sobs. I received a call at work from a Nicole fighting tears as she drove him to the hospital’s minor injury ward as recommended by the health visitor. His quiet sobs in the background actually reassured me that he was okay. At my first baby party last weekend I met my first lot of parents and their children. I was able to observe, Attenborough-like, each little faction and how they operated. With some you could see the physical traits shared with their offspring. But gradually you could recognise the more complex relationships, how each parent reacted to their child and vice versa. I was a little nervous at first as I’m not au fait with baby protocol. I know that if your dog runs up and starts licking another dog-owner you trust that they will tell the dog to stop, or simply embrace and enjoy it. Does this apply to babies? Do you just let them roam about, climbing and chewing people in the hopes that they will laugh and peel them off? These are the dynamics that I need to familiarise myself with and so I became quietly observant and took a lot of mental notes. One thing I noticed was how quick some parents were to swoop in and comfort their darlings at the first sign of discomfort. It was almost as though they pre-empted their unease, or perhaps on some level, I thought, created it – justified it. My laissez faire approach to Jackson falling over at my feet must have seemed like casual neglect as a nearby grandmother rushed to pick him up, and was stopped by me declaring him fine as he struggled to pick himself back up to carry on diving about the place. Today I couldn’t quite get him to shake it off and get over it. I didn’t want to overreact but after some thought and persuasion I thought I should be there. When I saw him, with his bruised head and swollen eye, he started laughing, unfazed. Us humans are pretty resilient it turns out. When I was a wee nipper myself, I had me an electric quadbike. My garden led to a back wall, and against this wall before we had a chance to plant sunflowers, the soil was left in such a way that it acted as a slope up to the vertical wall. I put my thumb down and revved up the garden, over the tile border, along the slope of soil and up the wall until the whole quad rolled backward and I split my head open on the tiles. Apparently my mother, hysterical, ran with me in her arms up and down the garden. But look at me now. Just fine, if maybe a little neglectful of my own child – but then maybe it was inherited.